Installing Postbox is pretty basic so I will not detail it here. But I will mention a few things. During the start of the install you are prompted for Clean install or Apple Mail. I suggest you use Clean if you can, but I did use Apple Mail with no issues. I don’t think I would use it as an RSS client since there is such good RSS clients out there – like ReadKit. Use the Password Manager – too bad it is not better integrated with Keychain. Some help to get you going can be found here. Get an idea of the features here. 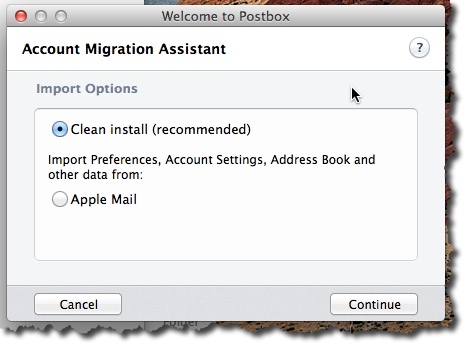 Don’t forget you can turn off Postbox and start Apple Mail and continue on. The rules are more easily found in Postbox rather than Apple Mail – Tools / Message Filters. Color incoming mail is something that is very easy in Apple Mail and is not easy or clear in Postbox. I will need to test more and write it up. Remember to watch this for my articles on this subject. I hope this is helpful. If you would have had me do the install process let me know. Next Post Bash Competitors? Not Good.